This indie pop duo from down under consists of Dave McGann and Chris Goff. Them Swoops is releasing its debut EP, but the band has already caught the attention of some big names. 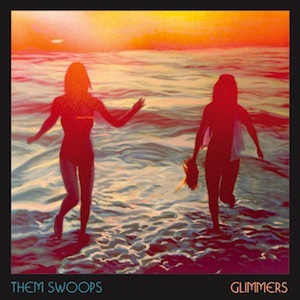 Glimmers was recorded in Melbourne and mixed in Los Angeles by Mark Needham (The Killers, Imagine Dragons, The Royal Concept). Their first single, “Work Around It,” landed on Sirius XM’s Alt Nation’s top 18 most requested songs in November. As if “Work Around It” wasn’t catchy enough with its tangy beat and driving lyrics, this EP includes a remix of the song by Cut Copy’s Ben Browning. Browning’s mix is psychedelic and pours sunlight into our hearts. “Rollerskate” keeps that sun shining bright guitars, pulsing vocals, and as the band says, “synth lines that melt the future!” For those of us hoping Them Swoops will skate on over stateside soon, the wait is almost over. US live dates will be announced at CMJ Music Marathon in New York City this October.